SimplifEyes 1Day is a new daily disposable contact lens enhanced by Dual Tangible Polymers designed to provide you with enhanced wettable surfaces, less debris build-up and excellent comfort. The company that developed the Tangible Hydra-PEG coating for scleral and hybrid contact lenses has a new polymer formulation specifically for soft contact lenses. 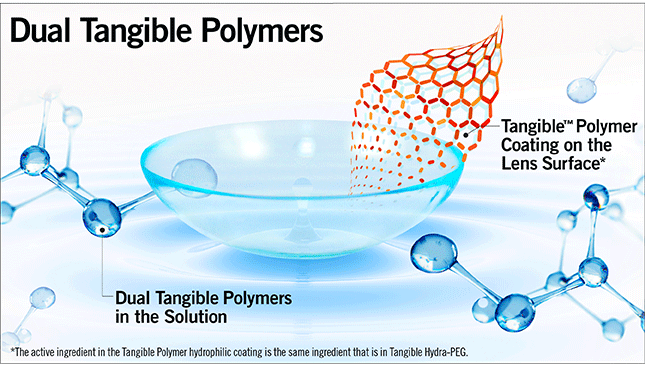 SimplifEyes includes Dual Tangible Polymers: One polymer coating on the lens surface and another polymer in the solution. Dual Tangible Polymers are designed for enhanced wettable surfaces, less debris build-up and excellent comfort. If you are interested in learning more about SimplifEyes 1Day, please fill out the form, call SynergEyes today at 877.733.2012 option 5, or email us. If you are interested in learning more about SimplifEyes 1Day, please fill out the form.